The MK vets disrupted Richmond and Umvoti municipalities last week, and also brought the two Midlands councils to a standstill. The Inkatha Freedom Party (IFP) in KwaZulu-Natal today condemned the latest protest action by uMkhonto weSizwe veterans (MK vets) who have been staging protests at various KwaZulu-Natal municipalities, demanding jobs, government houses and access to tenders. Members of the MK vets disrupted Richmond and Umvoti municipalities last week, and also brought the two Midlands councils to a standstill. 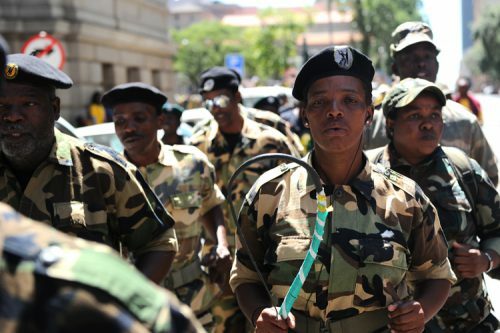 Blessed Gwala, IFP provincial spokesperson on community safety, said about 100 men wearing camouflage colours and claiming to be affiliated to MK vets had taken over Msunduzi District and Richmond municipal offices last week and have promised to spread across to other municipalities. “This method of doing things by MKVA vets undermines every individual affected by unemployment and lack of funding who also are looking for fair recruitment and processes to get opportunities,” Gwala said. Gwala said people who use violent and self-entitlement tactics to harass the fairness of distribution of opportunities must be harshly dealt with, adding that there were many young graduates in the province. “Everyone is suffocating from lack of employment and corrupt tendering system that have monopolised opportunities to only ANC close affiliates,” Gwala said.